Paul Albert Anderson was born at Sparta, WI, son of Lars and Lena (Pedersdatter Benerud) Anderson. In the late 1870’s he moved with them to Ventura, IA, where he attended elementary school at Ellington School and was confirmed at Ellington Prairie Lutheran Church. 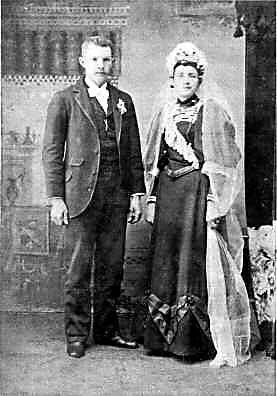 On October 30, 1895 he married Emma Caroline Anderson (1871-1961), and they farmed north of Ventura until 1901 when they moved to Kensett, IA, where he was an auctioneer until the time of his death from sar-coma cancer. Albert and Emma had five children: Myrtle (1895-1895); and Lucius (1895-1895); Edna, Mrs. Gilman Olson (1900-1988); Earl (1903-1973); and Alton (1906-1981).